Invest in your creativity and discover your community in the unique environment only an art school can provide. MassArt’s Professional and Continuing Education (PCE) offers over 100 courses and workshops in fine art and design, professional design certificates, summer immersive programming and more. Courses in over 20 disciplines in fine art and design taught by practicing artists and experienced teachers. With opportunities for all skill levels, you are sure to achieve your creative goals! Browse spring courses and workshops in fine art and design. Browse summer courses and workshops in fine art and design. 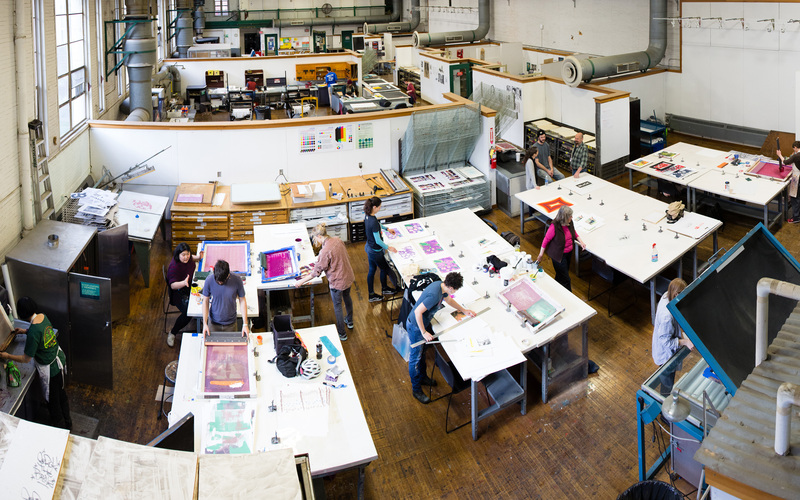 MassArt offers professional design certificates in Fashion, Graphic Design, Industrial Design, and Furniture for working adults seeking to discover or enhance their career in design. For people interested in the valuation of fine and applied arts, PCE offers the American Society of Appraisers series of valuation classes towards accreditation in personal property appraisal, along with connoisseurship classes taught by art historians and appraisers. Summer workshops in Bennington, Vermont, provide an opportunity to immerse yourself in your art without the interruptions and responsibilities of daily life. MassArt partners with Teaching for Artistic Behavior to offer an intensive one week institute in July. Spend a week with your peers and TAB educators to develop skills and gain a greater understanding of choice-based learning in Pre K-12 art programs.